Jeff Martin considers Monty Python's enduring US legacy, Imperialism, false Messiahs and coconut-laden swallows. I do not care a whit about the Beckhams. I have yet to watch Downton Abbey. I do not own any pictures of Lady Diana. I cannot say the same about pictures of Keeley Hazell. When I say that I try to keep up with current events in Britain, I mean I have some fine Twitter friends in the UK and I read both The Sun and The Daily Mail online. Trustworthy news sources, all. I’ve also benefited from the fact that our public television stations, back in the Year Of Someone’s Lord, 1974, began showing episodes of Monty Python’s Flying Circus. And let’s go ahead and reveal an important secret to you, my British friends: all Americans know of British culture comes from Monty Python’s Flying Circus. We still think John Cleese is in his mid-thirties, doing silly walks. Yes, there are a few of us knowledgeable enough of British popular culture to think of Shaun Of The Dead as the closest thing we’ll ever get to a Spaced movie, but there are more of us still who don’t know who or what Spaced was. But we’re talking about Python here, specifically the fact that about six years ago, a poll was taken of British movie goers. Brits, you voted Life of Brian the best British movie of all time. My friends, I don’t get it. I expected The Italian Job or perhaps Digby: The Biggest Dog In The World. Not Life of Brian. Here in the States, we love Monty Python And The Holy Grail. We quote it. All the time. All of us. Every citizen of the United States of America says at least one line from that movie every day. And frankly, we don’t think Life Of Brian is all that great. I mean, it’s funny. It’s okay. But we don’t make a concerted effort to watch it. In an effort to try to bridge the gap between our terribly disparate cultures, and build a tramway of love between our two formerly enemy countries, let me explain to you why Americans prefer Holy Grail to Life Of Brian. We’ve had our share of unfunny false messiahs. Even though it has been literally decades ago, we still don’t make jokes about the Peoples’ Temple. We don’t kick back with a piss-weak beer and crack jokes about David Koresh and that wacky compound fire that killed him and his followers. Actually, we’re still pissed about the duplicity of Emperor Palpatine. So when Brian’s mother screams, 'He’s not the messiah; he’s a very, naughty boy,' we Americans aren’t so sure. We think maybe Brian could lead dozens to their doom and we would be unable to stop it. Give him back his sandal. Leave our children alone. Our parents told us it wasn’t funny. By the time Life Of Brian hit our shores, our parents had already videotaped all the Flying Circuses with their gigantic wood-grained VHS behemoth machines. We learned of the Piranha Brothers in our bedtime stories. They had also seen and absorbed Holy Grail. From the first moose bite to the final reel spool-out. We knew brave Sir Robin had run away. We knew Camelot was a silly place. We knew we weren’t part of an autonomous collective. So when they saw Life of Brian, with its linear storyline, consistent characterisations and comedy more pointed than broad and absurd, they didn’t quite get it. It was like replacing Benny Hill with Maggie Thatcher. One was funnier than the other. We weren’t trained to love Brian Cohen the same way we were trained to love Tim the Enchanter. Blasphemy, Part I. Oh, the fuss when Life of Brian was released here! I was but a youngling at the time, but I can still remember the picket signs and the angry Christians, even a stern warning sermon from the pulpit of the church I attended at the time. 'This movie is making fun of Jesus! How dare you make fun of your Eternal Lord and Savior!'. Being a sweet little believer child, I swore I would never watch that foul, dirty movie. I didn’t realise that the people who were doing the protesting hadn’t actually seen the movie, either. It doesn’t make fun of Jesus at all! It wasn’t until I grew older that I was disappointed by that fact. Blasphemy, Part II. Americans didn’t really understand how funny blasphemy could be until the Internet came around. When we saw what other countries, especially Sweden, were doing with the art form, we rolled through and claimed it as our own, like the Imperialist bastards we are. The main reason we never quite accepted Life of Brian, however, is this: we liked seeing Graham Chapman in drag more than we liked seeing Terry Jones or Eric Idle in drag. It’s true. Americans have always been picky about their queens, since we don’t actually have a figurehead monarchy to deal with. And we loved seeing Graham in an outrageous hat and a prim dress, talking to Mrs. Preposition or waiting for the penguin on top of the television to explode. When he opened the door and showed all of us his gigantic meat dreidel, a little bit of Python died for us in America. Also, we were a wee bit jealous. See, in the States, we say lines from Holy Grail instead of actually having conversations. Why bother baring your soul and discussing your feelings when you can say, 'Ni!' instead? Love means never having to say, 'I love you', but it does require describing your beloved as having 'huge tracts of land'. We don’t argue about left versus right, Democrat versus Republican or the Judean Peoples’ Front versus the Peoples’ Front of Judea; we ascertain the airborne velocity of a coconut-laden swallow. So thank you, England, our true Motherland. 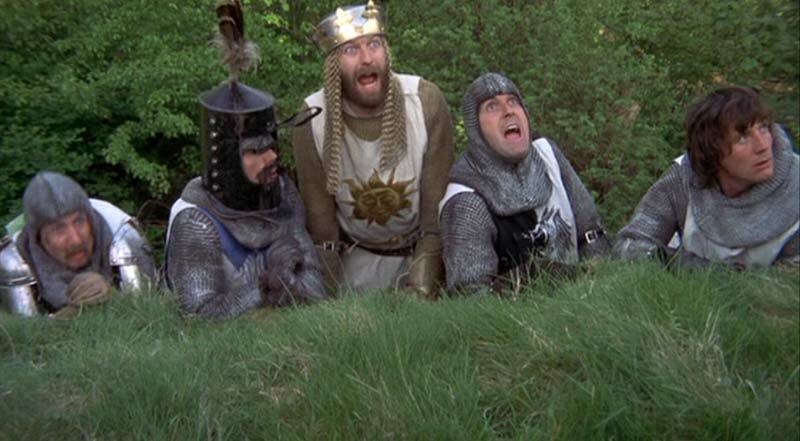 We may not have the fine taste for irreverence that you do, but you, and specifically Monty Python And The Holy Grail, taught we Americans an important lesson. As long as you can quote a movie, you never need to really talk to another human being again. Now go away before I taunt you a second time. Jeff Martin makes words go BOOM. He’s on the Internet and everything. Find his work at his own site, Better Geek Than Never. He has also smeared words on such websites as Brutal as Hell, The G.A.S.P. Factor and X and Sco Mark Out. He has also been published in Far Away Literary Magazine. Follow him on Twitter: @X_the_Unknown. I should note that one of Elvis Presley's favorite films in the remaining years in his life was Monty Python & the Holy Grail as he quoted that film constantly. 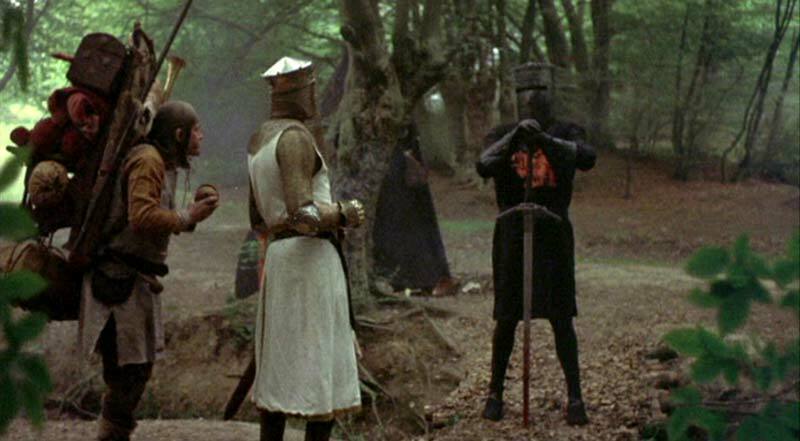 Could you imagine the King saying "It's just a flesh wound". I can and I think this is hilarious. Good trivia! this whole post is made of awesome! we used to tell everyone to watch out for my sister, because she may be little and cute, but she has, "sharp, pointy teeth!" It's brilliant isn't it (I can say this seeing as I didn't write it!). I'm a well travelled English man. Spent a lot of time in the US. That is a very perceptive piece of writing. Jeff is a great writer, njc. Love reading his stuff, especially this piece. I'm an American and like most i was introduced to Python through Holy Grail, however i prefer Life of Brian to the Grail. They are both awesome, my 2 fav comedies of all time, but i really like the message Life of Brian gives in not following anyone but instead think for yourself.